Maseeha Ibrahim Fulhu’s career with Crown & Champa Resorts (CCR) began in 2006 when she joined Komandoo Island Resort & Spa as a guest hostess. Maseeha has since grown into a beloved team member and was subsequently recognised as the ‘Star of the Month – October 2017’ and ‘Employee of the Month – October 2017’ for her friendliness, caring personality and exceptional work habits. In April 2017, she was also put in the spotlight in the ‘Komandoo Celebrities’ blog series. 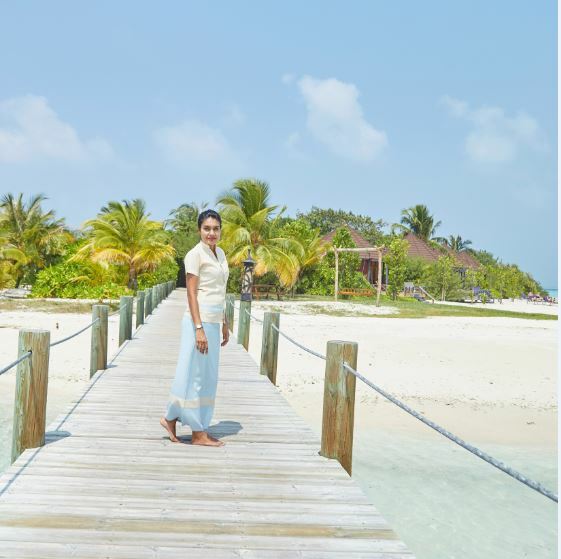 From the nearby Hinnavaru Island of Lhaviyani Atoll, Maseeha began her foray into the hospitality sector after she completed her O’ Levels at the Hinnavaru Atoll Education Centre. She then moved to Komandoo Island Resort and Spa, where she joined the team at Falhu—the resort’s main restaurant. Over the years, Maseeha was repeatedly credited for her impressive record in caring for the guests, and her unique initiative in taking the time to teach guests useful Dhivehi phrases; in return, expanding her vocabulary in other languages. A testament to her pleasant personality is also continuous guest feedback noting her personally; claiming she’s ‘forever young’ and the ‘Lady in Red’ when guests see her perform at vow exchanges on the island wearing the traditional red Dhivehi Libaas. Guests are also impressed by Maseeha’s ability to consistently keep their glasses full, and their tables empty so as to accommodate all the subsequent dishes they’ve set their sights on. Regarding the number of guests Maseeha has personally served at Falhu Restaurant since its opening, she adds: “Many of the guests become my friends once they return to the resort, maybe once, even twice a year. Some of them frequently invite me to join them on the house reef. I’ve served Brenda quite a few times now. We always do a ‘ladies’ snorkelling session’ and explore the marine life on Komandoo’s doorstep together.” Brenda has visited Komandoo Island Resort & Spa 12 times. According to Maseeha, Komandoo is such a distinctive place due to its smaller size that warranties privacy and permits guests to get into a relaxed holiday mood. Moreover, its stunning house reef with resident sea turtles is not to be missed, along with the fact that team members and guests truly adore the cosiness and serenity of the island and can describe it simply as ‘sweet’ – just how many guests probably portray Maseeha. Maseeha is very supportive of her colleagues – in addition to hostess duties, she works hard to set-up tables at the restaurant, and her team ensures both the restaurant and the bar are decorated as required for any special events. Maseeha is the one who often initiates handling and arranging event decoration – a real leadership position. “I, along with a team of ten waiters, set up special tables in the restaurant for occasions such as birthdays and wedding anniversaries. Such work really brings the team together, we always look forward to making the table even more special for our repeat visitors,” says Maseeha. Every two to three months, Maseeha also attends classes, to improve her skills in new foods, wines and beverage offerings. Most recently, she successfully completed a programme on training and assessment in Food Safety. 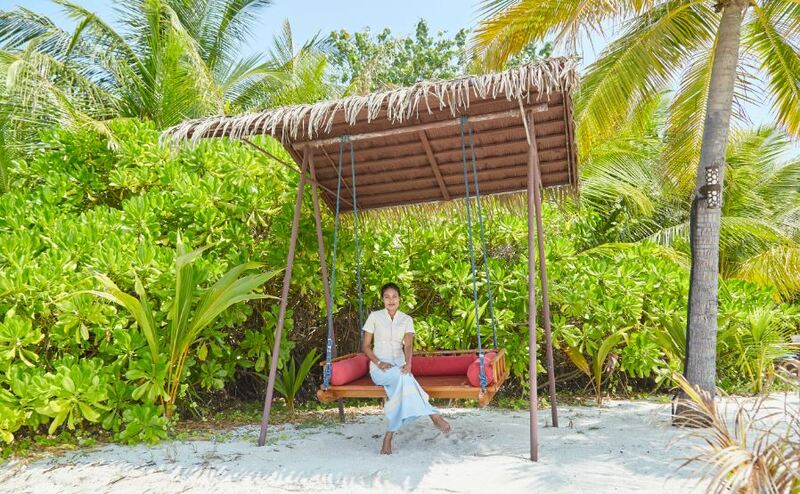 Maseeha, applauded as one of the first female employees at Komandoo Island Resort and Spa, tells Hotelier Maldives that her long-term goal includes increasing awareness on the potential for women from nearby islands to work in the hospitality industry. In an industry where women make up only eight percent of the workforce (of which only three percent are locals), her accomplishments are remarkable. “When I first joined, there were just a couple of girls, you could count them, just two or three. The number of females working, or wanting to work in the hospitality industry, has since increased exponentially,” says Maseeha. Maseeha Ibrahim Fulhu has been commended for being efficient and memorable in a location where it is easy to forget who is serving you. The resort management has earmarked her to be a valuable team member who deserves special mention. “I am so thankful and grateful to be someone who can make a difference in the hospitality industry. I remember thinking about an employment opportunity that would not take me too far from my home in Hinnavaru, and then I came to Komandoo as it is the best place to be. CCR has been good to me, with the management and team members giving me guidance and none-stop support. Now, I love it when people say I am part of the CCR team,” she adds.